Summer's not quite over, although this is the first day of school for certain people. 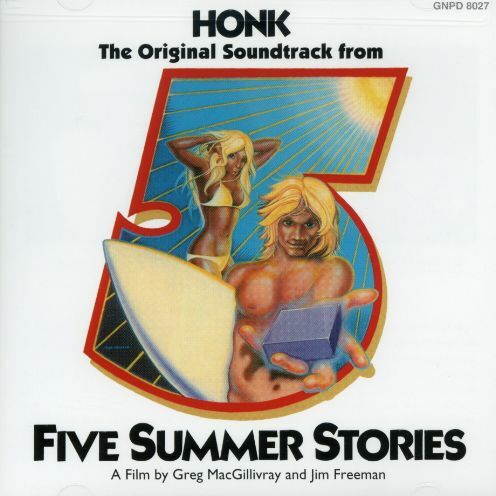 And so the 283rd Soundtrack of the Week is the music for Five Summer Stories by the band Honk. The first track is a very short piece called "Creation". It's a bit ambient, a bit noise. It leads into the sunny country rock song "Blue of Your Backdrop", which almost has a Grateful Dead feel to it. There's an instrumental version of it later. At first "Brad and David's Theme" has a feel similar to "Blue of Your Backdrop" but is a guitar-led instrumental that goes into almost jazzy areas. "High in the Middle" is more of a straight country song with prominent piano and pedal steel guitar. It also makes me think of the Dead and bands associated with them. "Hum Drums" is, surprise, a drum solo, and a pretty rocking one. After that comes "Bear's Country", another toe-tapping piece with some great twangy guitar playing. Post-Brian Wilson Beach Boys is what "Made My Statement (Love You Baby)" makes me think of. Good playing on this one, especially by the drummer", but it grabs me less than the other tracks. "Don't Let Your Goodbye Stand" is an earnest and heartfelt song, with a pleasingly brisk tempo and some nice Hammond playing. The famous surfer Gerry Lopez is immortalized in the ethereal "Lopez", which exploits the potentials of electric piano and Hammond organ. "Tunnel of Love" is an intricate instrumental that suggests what a Booker T & The MG's prog album might sound like. Finally there's the triumphant "Pipeline Sequence", which reminds me of a cross between Van Halen's "Jump" and the tune "Melting Pot" by Booker T & The MG's. It's great!